If you've made the choice to seek permanent residence, if you are an employer seeking to hire a person from out of the United States for a permanent position, or if you a permanent resident seeking to become a U.S. citizen, a Houston immigration lawyer can assist you in the often complex process of attaining your goals. 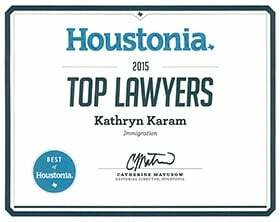 Kathryn Karam and her team at Karam Immigration Law have taken on complex cases and difficult immigration matters, finding creative solutions to help people become permanent residents and U.S. citizens. Call Karam Immigration Law today at (832) 582-0620 to set up a consultation. Can I Lose My Permanent Residence? Each of these Green Cards and Citizenship topics are detailed below. Getting a "green card" means to become a permanent resident. You receive a form of ID that is a card that says the date you became a permanent resident and has a code that indicates how you became a permanent resident (for example, through employment, a family member, or other means). Yes. You could lose your status if you stay outside the country too long, move to another country, fail to file income taxes or otherwise demonstrate that you do not intend to be in the U.S. permanently. In addition, permanent residents may be deported from the United States if they commit certain crimes. If you think you may be at risk of losing your permanent residence, talk to an experienced immigration lawyer immediately – there may be actions you can take to protect your permanent resident status. For example, if you obtained your permanent residence through employment, you should not necessarily lose your permanent resident status if you lose your job. If you obtained your residence through a family member, you do not lose your permanent residence if the family member who filed a petition for you to get your green card dies. If you obtained your permanent residence based on marriage, you should not necessarily lose your permanent residence if you divorce your U.S. citizen or permanent resident spouse after you have been issued your green card. However, permanent residence status does expire after 10 years. You must renew your resident card to maintain proof of your status. Those who obtain their green card through a marriage that is less than two years old when their green card applications are approved are issued a conditional resident card valid for two years. This means that there are conditions attached to the green card which must be removed before the card expires. After successfully removing the conditions on their residence, these individuals are issued permanent, 10-year resident cards as are all other permanent residents. If you are a Conditional Resident and do not apply to remove the conditions on your residence, you will be placed in immigration court, so it is important to file to remove conditions on your residence, even if you are no longer married to or living with your spouse.